Mutations of one copy of TET2, whose protein product promotes DNA (and RNA) hydroxymethylation (and eventually, DNA and RNA de-methylation, are commonly associated with myelodyspastic syndromes (MDS) and acute myeloid leukemia, among other hematopoietic neoplasms. Previous work had suggested that Vitamin C, an essential co-factor of TET2, can promote TET2 activation as well. 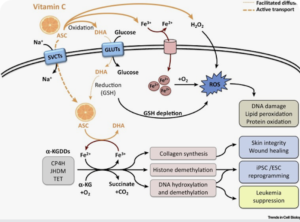 We found that high dose vitamin C, acting via residual TET2 and TET3, had potent anti-neoplastic effects in mouse and human models of MDS/AML. Molecular analysis confirmed that this treatment promotes demethylation of key leukemia-associated genes, including base excision repair genes. The latter result suggested that PARP inhibitors might further increase Vitamin C efficacy, which we also demonstrated. Trends Cell Biol. 2018 Sep;28(9):698-708.